The Agency will find it more difficult to meet its savings targets now that some sentencing reforms designed to reduce the prison population have been dropped. "The National Offender Management Agency has delivered spending reductions and achieved value for money since the last spending review. However, its spending is vulnerable to even slight changes in demand, over which it has no control, and it has very little flexibility to absorb unforeseen costs. There are therefore risks to the Agency’s ability to make sustainable savings over the long term, when the prison population is unlikely to fall significantly and the Agency’s funding will continue to reduce." 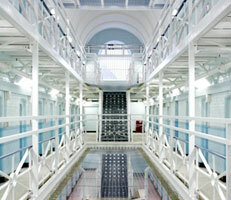 The National Offender Management Service, an Executive Agency of the Ministry of Justice, faces substantial financial and operational challenges, including a vulnerability to unexpected changes in the prison population, and will find it more difficult to meet its savings targets following decisions to drop some sentencing reforms designed to reduce the size of the prison population. The National Offender Management Service achieved value for money in 2011-12, as it hit its savings target of £230 million while restructuring its headquarters and it has broadly maintained its performance, such as in reducing reoffending. As a result of some sentencing reforms not going ahead, the Ministry of Justice lost around £130 million of savings. Given the loss of these reforms, the prison population is now unlikely to fall significantly over the next few years. This limits the Agency’s plans to close older, more expensive, prisons and bring down costs. The Agency’s savings target for 2012-13 of a further £246 million is challenging and it currently projects it will spend £32 million more than its budget. Its cumulative annual savings target increases to over £880 million by 2014-15. The Agency currently has a £66 million shortfall in the £122 million needed over the next two years to fund early staff departures aimed at bringing long-term reductions in its payroll bill. The Agency has restructured its headquarters, reducing staff numbers by around 650 from around 2,400. Despite having fewer staff at its headquarters, prison governors, probation trust chief executives and other stakeholders consulted by the NAO generally regarded the restructure positively, considering it produced a more efficient organization with greater clarity on accountability. The Agency relies on the probation profession to deliver reforms and to reduce costs, but there are some tensions in the relationship. The NAO found that the Agency has done much to ensure knowledge of probation is captured at its headquarters but has recommended the Agency continue to engage with probation trusts to address their perception it lacks understanding of probation issues. The Agency’s responsibility for offenders means that its core business is managing risk. It has strong risk management mechanisms at its headquarters and in the oversight of prisons. However, there are gaps in how the Agency consolidates the recording of risks from prisons at a regional level, meaning the Agency may be unaware of risks in different areas.